Upcoming Performances - Please click on the flute image below to link with our performance locations and dates. "The First Flute", David Bouchard's powerful new book, will be out this spring! It is a captivating tale of a young man and his journey with the first Native American Flute! Stephen Rensink continues to produce stellar flutes...and David is bringing more of them back to share at his upcoming talks throughout the provinces! Watch for more information about Stephen and MAKWA Flutes coming soon! More than 30 students of R W Zahara Elementary School in Sexsmith, Alberta have just begun their musical journey with the ever -evolving Native American Flute. 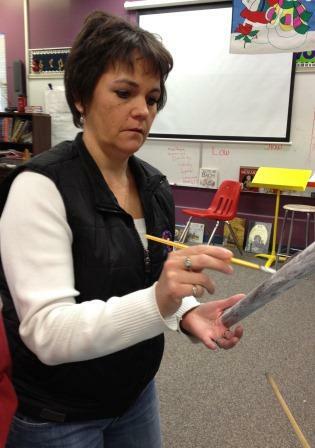 With the assistance of John Fletcher, and Mrs. Glenda Ross, students constructed their own Northern Spirit Flutes from ABS food grade plastic, and are now sanding and painting them. Apart from the flute construction and artwork, the intensive school world music program involves flute instruction, storytelling, research, music composition, personal and public flute performances, music video production, and nature study. 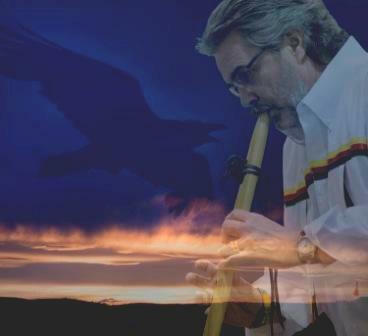 Beaverlodge Cultural Centre - July 24, 7-9 p.m.
Herb Stanley of Chinook Winds, has put out his second CD of Native American Flute Music. The CD is called "Mystic Warrior" and is a powerful selection of Herb's original melodies and healing energy! For information on how to order this CD, please email Herb. On February 26, members of the Peaceful Night Flute Circle will appear as featured guests at The Potluck in the Basement Singers' Coffeehouse at KPAC in Dawson Creek. The coffeehouse is a fund raiser for the future Calvin Kruk Art Centre. Herb Stanley generously donated several of his CD's for use as door prizes! Thank you Herb!!! There will be a flute circle meeting of the Western Branch of the NANA Flute Circle at David Bouchard's home in Victoria, BC, at 1 p.m. on Sunday, December 12, 2010. Please contact David to let him know if you are attending, so that he may plan spacing and room for flutes. Bring your collection, songs, and passion for the music we all share and love! The SongKeepers 2010 DVD is out and available... check out Northern Spirit Flutes! Power Shift, the video about the Bear Mountain Windpark near Dawson Creek, BC, was released. Members of the Peaceful Night flute circle and Janina Carlstad performed for the launch! Janina presented a flute workshop to music teachers in a district PD day on August 26 and continues to work on the music video for PowerShift... soon to be released. Janina and students record melody and vocals for "The Turning", a song to accompany the video for Don Pettit's newest book and video "Powershift". Peaceful Night Flute Circle plays at the Dawson Creek Library for the Seniors' Strawberry Tea. Leona Green of Hillspring Wildlife Rehabilitation Facility presented a beautiful wall plaque to Bonanza School Students (and Peaceful Night Flute Circle) in thanks for the support of the school community who raised over $1200 for the Wildlife Rehabilitation Facility on Earth Day. "Song for the Earth" concert was held as a collaborative venture to support and aid Mrs. Green with food, medication, and bedding, etc. that she might need for the wildlife in her care. Rich provided a half day workshop on making and playing the Northern Spirit Flute as a fundraiser for Oxfam Saturday, April 24 at White Buffalo Youth Lodge in Saskatoon. Many beautiful flutes were created and the event was a great success! Peaceful Night Flute Circle presented "Song for the Earth", a musical journey and Art Show with flutes, percussion, and vocals at the Bonanza Hall in Bonanza, Alberta. The event was in honor and support of the Hillspring Wildlife Rehabilitation Facility and raised over $700 through silent auction items graciously donated by community members! *David Bouchard was honored in Ottawa on April 7, 2010 with an Investiture into the Order of Canada! Congratulations David!!! *Ian Porteous of Les Bucherons is offering a flute building workshop to grade 5/6 students, using Northern Spirit Flute kits by Saskatoon's own Rich Dube. The workshop will be part of an "artist in residence" program at Garneau School in Edmonton. *NANA members met in Edmonton for a few hours of song and reflection! A big thank you to Herb Stanley for guiding the circle! *NANA now has over 80 members on Facebook! *NANA welcomes new members - James Skillern from Raleigh, North Carolina, Andre Couilloneur from Edmonton, Alberta and Bill from Windsor, Ontario! *Janina and members of the Peaceful Night Flute Circle were featured on local television's CJDC News in a 5 minute video clip entitled "Around the Peace". A few days later, the Peaceful Night Flute Circle played for an "Alternative Energy Solutions" conference in Dawson Creek. *David Bouchard along with accomplished guitarist, Syl Thompson, have completed their dynamic CD entitled "Seven Sacred Songs". The CD will be available in April 2010! *Member flutist and flute player, Rich Dube, has created a video about making food grade ABS flutes. He showcases this video on Youtube and it is easy to see how this would be a tremendous class or flute circle project! For more information about incorporating flutes into educational, community, and flute circle programs, also check out RIch's website, Northern Spirit Flutes. Six of Bonanza School’s Peaceful Night Flute Circle students performed Saturday night at the Peace Region Songwriters’ monthly coffeehouse. Held at Dawson Creek’s “Under the Willow – A Cultural Café” the girls joined with a variety of other Peace Country musicians during open mic sessions to share their music and songs. “Girl Power” as the girls called themselves, played their red cedar flutes for an audience of 50 or more. The girls offered both original musical arrangements as well as a few traditional songs. The Peace Region Songwriters’ Coffeehouse is held on the last Saturday of every month at Under the Willow. Girl Power and other Peaceful Night Flute Circle students will undoubtedly be seen playing there over the next few months as students eagerly compose and practice new songs. *Peaceful Night Flute Circle and Bonanza School had a very inspiring and exciting visit with Saskatchewan flute player, Jason Chamakese. Jason played songs from his debut CD, Midnight In Clearwater. *Janina and the Peaceful Night Flute Circle performed for the Place At the Table Annual Concert, a Peace Region Songwriter fundraiser for the Salvation Army Food Hamper Program. Approximately 12 students played a variety of songs - Huron Carol, O Tannenbaum, Kumbaya, Silent Night, Cherokee Morning Song, and our own Windflower song! Janina later played solo! Flutemaker, Rich Dube, from Northern Spirit Flutes, donated a flute while NANA donated a book of songs to the cause. The concert made about $1000 for the Salvation Army. *NANA is pleased to welcome new members, Rich Dube, Herb Stanley, and Mary Parslow to the circle! Please check out their profiles on our "Caring" section of Hints and Insights.... AND don't forget to check out their websites or contacts on our Links pages! *We've been excitedly awaiting the launch of one of David's greatest ventures yet, "The Seven Sacred Teachings". This collaborative venture between David and Dr. Joseph Martin, with artwork by Kristy Cameron, is a writing project which focuses upon seven teachings that are integral to healthy living for all of humanity! 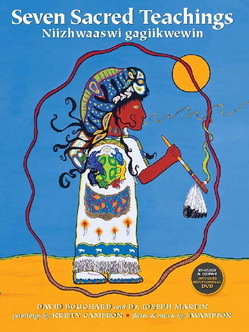 "Seven Sacred Teachings" features seven flutes of seven different types of wood and keys with seven different songs (made by flute maker and flutist, Swampfox) to illustrate each of the sacred teachings in this book. Published in seven different languages, "Seven Sacred Teachings" is a literary work like no other! 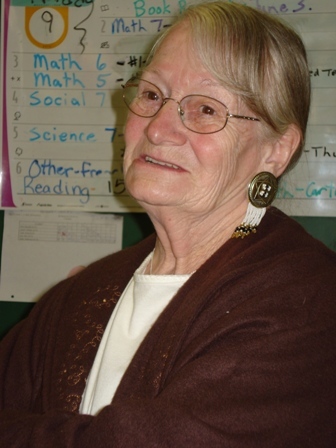 The book launch took place at an Honorary Pow wow on September 21, 2009 at Fort Frances, Ontario. The event featured many honored guests in a beautiful celebration set within a stunning setting - a highlight in David's journey, to be sure. *Nicholle was honored to perform several flute songs for the Opening Ceremonies for the World Skills Competitions... Students from all over the world converged in Calgary to learn about and compete in a variety of skills! Dawson Creek members of the NANA Flute Circle are planning their first circle within the next month...stay tuned for times and dates, friends! The Peaceful Night Flute Circle of Bonanza School, in northwestern Alberta, has expanded into Beginner (Peeps of the Peace... ), Junior and Senior Levels! The Juniors received their flutes in mid-September and are playing and playing whenever their school schedule permits! All of the Peaceful Night Flute Circle members are participating in the Alberta Arts Days Challenge this September with an original song about the Bear Mountain Wind Park. The Song is entitled "Elemental Windflowers" by J. Carlstad. Dawson Creek, BC sees a growing interest in the music of the Native American (style) Flute as the flutes are seen out and about at various coffee houses and art events. NANA welcomes several new faces to the circle as individuals seek to purchase flutes of their own. Where there were only a few flutes in the locale in the past few years, now over 50 flutes have been purchased or used by students and individuals in and around the community! The beauty of music is in the sharing! Members of Edmonton's French Canadian Music Theatre Company, Les Bucherons, have invested in several Native American Style flutes... and are excitedly looking forward to adding the beauty of the flute's voice to their educational and entertaining programs! Best wishes and best of luck to you, staff and associates of Les Bucherons!!! We look forward to hearing more of you through NANA! NANA's Launch of the Nana Flute Circle was successful, and is now officially a site where anyone interested in sharing and learning about the flutes may converge! NANA will launch their official website on Earth Day, April 22nd! NANA formed in mid-winter of 2009. David Bouchard (pictured above) has played his flutes for several years, building up a personal collection which he takes with him as he travels the country making presentations about literacy and his many award-winning books! Collaborating with fellow educators, Janina of SomeAre Solstice, and Nicholle, a Mi'kmaq teacher and storyteller from Northern Alberta, David and the girls formed NANA (Northern Alberta Native American Flute Circle). Following their passion for the instrument and excited to share, the trio formed a Facebook Group of the same name in February. Although most connectivity between the 20 + members occurs as a "cybercircle", NANA held its first meeting at the River Cree Resort, outside Edmonton, in early April of 2009. Members perform individually in classrooms, conferences, and storytelling circles, as well as at local coffeehouses and community concerts, or just for their own benefit - always honoring the voice and legacy that is the Native American Style Flute. Many members are just in the process of learning or acquiring flutes, while some members are flutemakers or seasoned flutists. Any who are interested in pursuing the interests related to the Native American Style flutes are welcome!